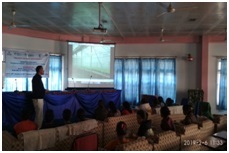 KVK Ri-Bhoi Organized Skill Development Training on “Floriculturist - Protected Cultivation” under ASCI. 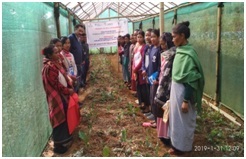 The KVK Ri-Bhoi has successfully trained twenty youths and farmers from Ri-Bhoi district of Meghalaya on skill development qualification pack “Floriculturist – Protected Cultivation”. 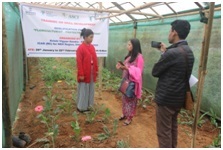 The Prime Minister of India flagship programme under the Agriculture Skill Council of India (ASCI) was started on 29th January and the final assessment was done by independent assessment agency MSAG on 5th March, 2019. During this month long training progarmme with 200 hours contact period the training schedule was prepared and approved by ASCI. Training was done on three modules viz. theory, practical and assessment. Under theory and practical detailed techniques of site selection, methods of construction of polyhouse, land preparation, planting, soil health management, nutrient management, plant protection, harvesting, post harvest management, marketing, record keeping and SHG mobilization were thoroughly discussed. 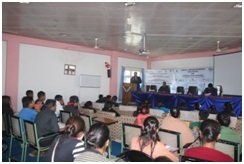 During the course of the programme, practical demonstrations were conducted and exposure visits were undertaken. The training programme ended with assessment of trainees and subsequently the qualified trainees will be awarded with certificates in due course of time by ASCI. The post training placement monitoring is under progress through Dr. Utpal Barua, SMS Horticulture of the KVK Ri-Bhoi, Master Trainer of the programme.